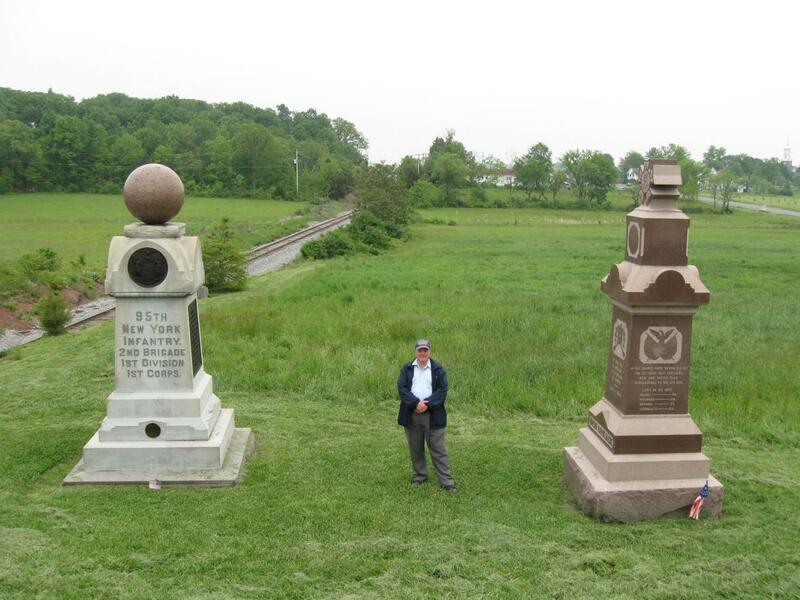 Gettysburg Licensed Battlefield Guide Rich Bellamy is standing on East McPherson’s Ridge near the monument to the 56th Pennsylvania Infantry Regiment. The bronze monument was dedicated on September 11, 1889 and cost $1500. Sheads Woods on Seminary Ridge are in the background. This view was taken facing east at approximately 5:30 PM on Thursday, May 13, 2010. 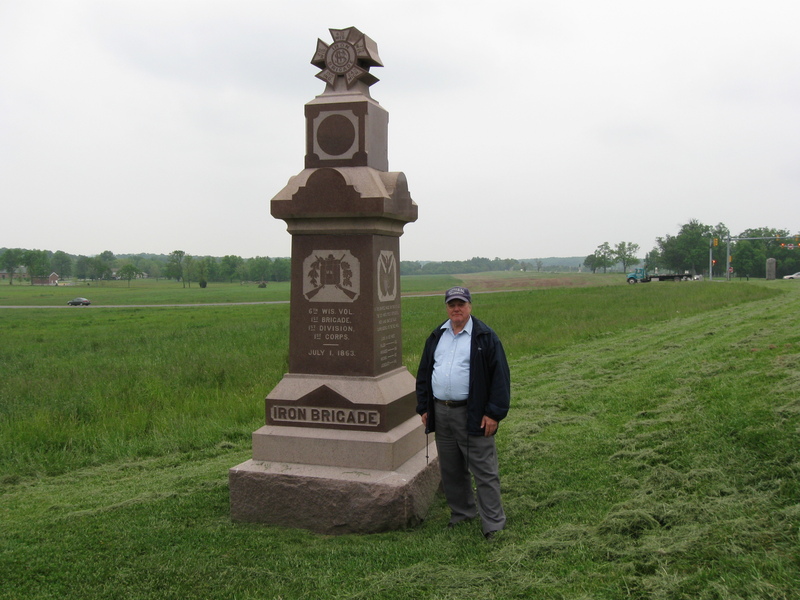 In the second Cutler’s Brigade post Gettysburg Licensed Battlefield Guide Rich Bellamy discussed three regiments in Cutler’s Brigade, the 76th, 84th, and 147th New York Infantry regiments. In today’s Cutler’s Brigade post Gettysburg LBG Rich Bellamy discusses two regiments in Cutler’s Brigade, the 56th Pennsylvania and 95th New York, and a regiment in the Iron Brigade- the 6th Wisconsin. 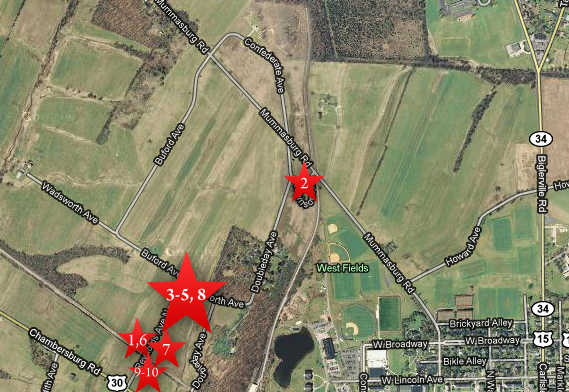 This map shows the location of the videos for Cutler’s Brigade posts. Video #1 was taken near the statue of Brigadier General James Wadsworth. Video #2 was taken at the monument to the 104th New York Infantry Regiment. Videos #3 and #4 were taken at the Cutler Brigade plaque on Reynolds Avenue. 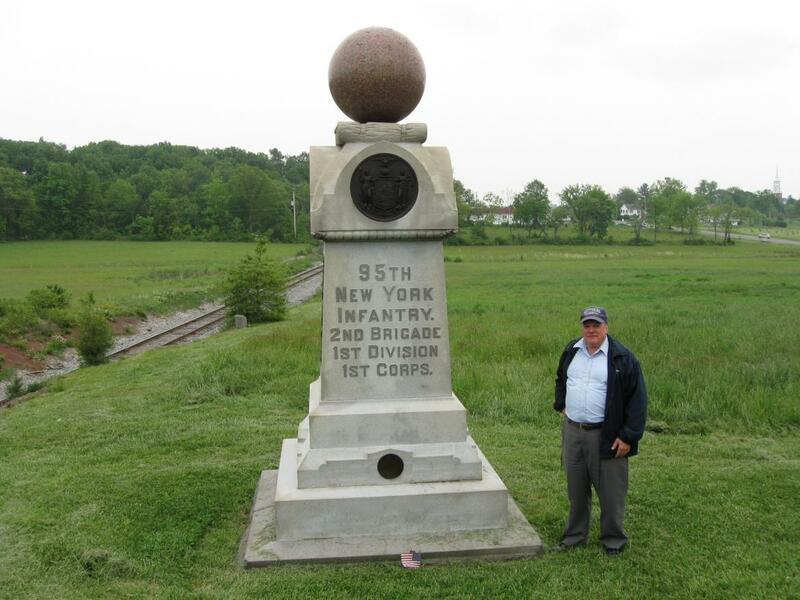 Video #5 was taken at the monument to the 76th New York Infantry Regiment. Video #6 was taken near the railroad cut. Video #7 was taken near the monument to the 147th New York Infantry Regiment. Video #8 was taken near the monument to the 56th Pennsylvania Infantry Regiment. Video #9 was taken near the monument to the 95th New York Infantry Regiment. Video #10 was taken near the monument to the 6th Wisconsin Infantry Regiment. This map was created facing north at approximately 5:30 PM on Wednesday, May 19, 2010. 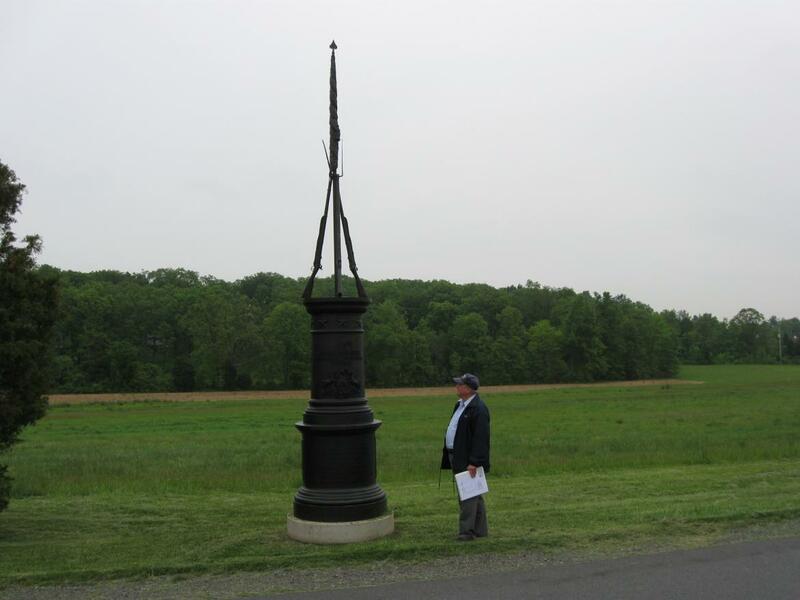 In Video #8 (Videos #1-#7 were shown in our previous Cutler’s Brigade post) Gettysburg Licensed Battlefield Guide Rich Bellamy is standing on East McPherson’s Ridge near the monument to the 56th Pennsylvania Infantry Regiment. He reads an account of the first shots by Union infantry at the Battle of Gettysburg. This view was taken facing northeast at approximately 5:30 PM on Thursday, May 13, 2010. Licensed Battlefield Guide Rich Bellamy has now moved to the south side of the railroad cut. The monument to the 95th New York is on the left and the monument to the 6th Wisconsin is on the right. In the right background is the Chambersburg Pike. Sheads Woods is in the background on Seminary Ridge. This view was taken facing southeast at approximately 5:30 PM on Thursday, May 13, 2010. The monument to the 95th New York Infantry Regiment was dedicated on July 1, 1893. This view was taken facing southeast at approximately 5:30 PM on Thursday, May 13, 2010. In Video #9, Licensed Battlefield Guide Rich Bellamy provides some background on the 95th New York and asks if anyone has any documentation that Colonel George H. Biddle’s son fought on the staff of Confederate Major General John Bell Hood at Gettysburg. This view was taken facing southeast at approximately 5:30 PM on Thursday, May 13, 2010. The monument to the 6th Wisconsin was dedicated on June 30, 1888. This view was taken facing south at approximately 5:30 PM on Thursday, May 13, 2010. In Video #10 Rich Bellamy provides information on the 6th Wisconsin (part of the Iron Brigade, but originally commanded by Lysander Cutler) and their Gettysburg commander, Lieutenant Colonel Rufus Dawes. This view was taken facing south at approximately 5:30 PM on Thursday, May 13, 2010.